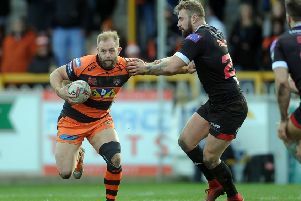 It was tight, but Castleford Tigers maintained their unbeaten pre-season record with a 20-18 victory over Widnes Vikings at the Mend-A-Hose Jungle thanks to a last-gasp try by Denny Solomona on Sunday. In front of a crowd of 2,141, the Tigers hit back from 14-10 down at half-time to make it four wins from four. For a reaction to the match, see Thursday’s edition of the Pontefract & Castleford Express.